Leading presidential candidate Rody Duterte mimicked former justice secretary Leila de Lima and cursed over fifty times in his public speech during an event in Taguig on Sunday. 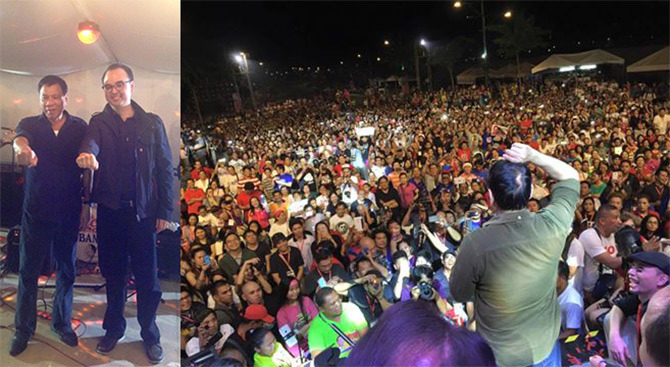 The November 29 "MAD For Change" concert paved the way for Duterte and his running mate, vice presidential candidate Alan Peter Cayetano, to appear together before a large crowd at McKinley Hill in Bonifacio Global City. Although the Davao City mayor came late in the evening, his supporters patiently waited for him to arrive. The hours of waiting paid off when the presidentiable started to deliver his unscripted speech that became a funny storytelling. Duterte was casual, very frank, and honest as he narrated his experiences and accomplishments and presented his plans and ways to implement all of it when he gets elected to the highest position in the country. Here's a video replay. Duterte's speech starts at 4:32:00.